The Children’s Commissioner has launched a new ‘Digital 5 A Day ‘ campaign to provide a simple framework to help children lead healthy online lives. The approach reflects the concerns of parents/ carers as well as children’s behaviours and needs and seeks to promote a positive relationship with technology rather than relying on restrictions. Based on the NHS’s evidence-based ‘Five steps to better mental wellbeing’, the ‘Digital 5 A Day ‘ campaign gives children and parents easy to follow, practical steps to achieve a healthy and balanced digital diet. It can also act as a base for family agreements about internet and digital device use throughout both the holidays and term time. 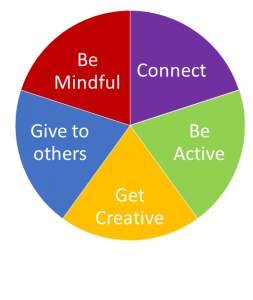 The 5 elements of a good ‘digital diet’ are: connect, be active, get creative, give to others, be mindful. Further information about the ‘Digital 5 A Day ‘ can be found online. This includes a ‘Digital 5 A Day ‘ guide for children and young people. Childnet has also published some useful summaries and links on their blog. Educational Settings and professionals working with children may find it helpful to share and use the ‘Digital 5 A Day ‘ and associated links and resources with the children and families that they work with. The idea of the internet being used as a ‘babysitter’ is often reported as being a concern by professionals and parent alike. However, time spent online doesn’t have to be spent passively consuming content; it can be educational, creative and can provide excellent opportunities for children to build skills that can be useful for later life. Educational settings could use the internet to engage with their community and demonstrate that they listen to children’s voices. This could include online questionnaires, polls, blogs, videos, competitions etc. By adopting this approach, educational settings can help and encourage children to use the internet to give positive support and feedback to their community. Educational staff can also help and support children to report any negative behaviour or activity online – this will help to help the web make a positive place for everyone. If educational professionals have suggestions as to how their setting is adopting or demonstrating their approach towards a ‘Digital 5 A Day ‘, then please leave your suggestions or additions in the comments section below. This entry was posted in 2017, Children’s Commissoner, e-Safety, Education Leaders and Managers, Online Safety, Schools and tagged Children’s Commissioner, Digital 5 a Day. Bookmark the permalink.